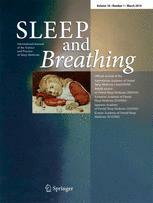 The journal of ‘Sleep and Breathing’ is now in its 16th volume year, providing papers with an Impact Factor of 2.869 for 2013/2014. The European Academy of Dental Sleep Medicine decided to affiliate with the journal of Sleep and Breathing already several years ago in order to jointly improve the exchange of research ideas and to improve the scientific quality in the field of dental sleep medicine. It is the intention of ‘Sleep and Breathing’ to strengthen this connection and, therefore, a discounted subscription is offered to all of EADSM members at the rate of € 40,- EUR per year when not already included in the type of membership. Subscription is indeed included in the membership fee for full members and student members. Free of charge, all area members! EADSM invites you to register for the journal’s Table of Contents alert, which is free of charge, even for members that didn’t opt-in for the subscription offer.